Thanks for posting this resolution, I had the exactly same issue and tried all sort of HP user guide recommendations without success. I came across this article during the night and it worked when I tried it the next day. Never was I so eager to go work before. Lol. This is my first time setting a SAN and FC switch, for a moment I almost give up, doubting my own tech capability. Your generosity has once boosted my confidence. Will definitely back to visit this site again. Hi Andy, excellent! Glad to hear it someone out 🙂 Thanks for dropping the feedback here. Just adding my thanks. I’m configuring a P2000 G3, iSCSI not FC. It was shipped to me with both controllers installed and I had the same issue as you. Booting off one controller has fixed the problem. Adding the second controller back in, it continues to function without issue. Appreciate you sharing your solution. Take care. Good to hear, and glad it helped! Thanks for leaving some feedback. Ouch! Glad it helped you sort the issue out though 🙂 Thanks for the feedback. I have an identical setup I am trying to get going as well. Thanks for the solution even got my web browser to work after trying this! Just in case anybody else is stuck I found the command show shutdown-status really helpful in trying to find out the states of the controllers. Thanks for the feedback Brian – glad this post helped you, and cheers for the status command – very useful! I have another issue regarding HP MSA2000, which may possibly be linked up with this one. As I was working on the server with whom my RAID is configured. The RAID drives suddenly disappeared. I checked the RAID enclosure physically and it was giving all 3 LEDs on front panel i.e., UID, Fault and Heartbeat LEDs as permanently ON but all the LEDs on all of the hard drives were OFF. It has only one controller in it and there is no light ON on the controller. Both the power supplies are giving solid green lights and their fans are running. Please see if any one of you can relate a possible solution to it. Thanks for the post. Saved my buttocks during a DR invocation, due to an extended power failure, where the SAN wouldn’t boot up properly. I was thinking of trying this but doubted myself just before reading this. Maybe us IT guys aren’t that crazy after all. Thanks a million. 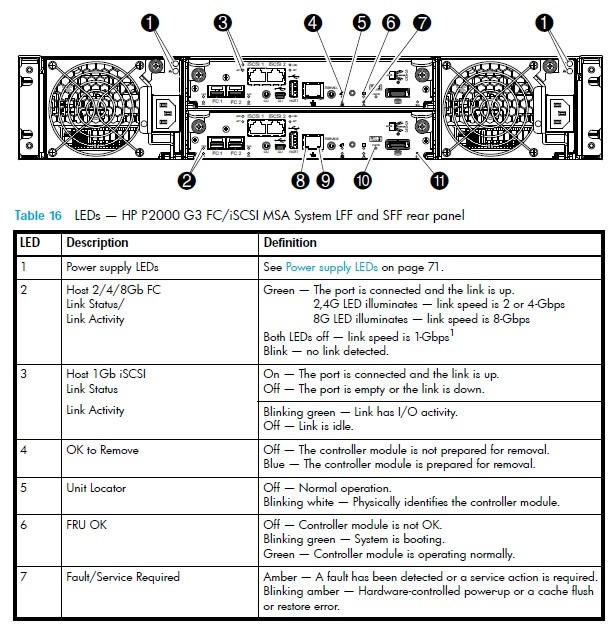 Don’t forget the serial port access to these controllers.It gives valuable info on what state the controllers are in.Check the msa cli guide on HP for info. Seen a few apparent lockups caused by firmware updates(controllers can copy between themselves). Use a USB mini cable with the HP driver and putty to hook up. One of our MSA2000 controllers A and B doesn’t show any responce but enclouser got powered ON Fans, power units also working perfectley. Suddenly it got stopped and no amber no light. I have removed controller node and replace it again but still it doesn’t showing any response. No lights at back side of controllers..Could you please help me in this..
Are you able to shutdown the entire enclosure and try a power cycle? Anything more than this I won’t really be able to help you with – this sounds to me like a hardware issue, so a complete power cycle might be the best way if you can afford the down time. I recently had an issue with our P2000 at work and contacted HP support. Even though it was out of warranty, they still helped me troubleshoot and found the issue to be a faulty controller. Thank you so much for your post, I was really stuck on this one. I am not a storage expert but I was the only one available to help bring back a customer online. HP manuals and troubleshooting all failed to work.